← Cwestiynu’r Gweinidog Iechyd ar fynediad i gyffuriau canser. Questioning the Health Minister about access to cancer treatment. Posted on 09/03/2015 | Comments Off on Questioning the Health Minister about access to cancer treatment. My questions to the Health Minister last week about new procedures in deciding access to cancer treatment. Here’s a link to the video, and there’s a transcript below. Minister, the process of accessing new medicines and treatments continues to be difficult and inconsistent in Wales. In Scotland, a new medicines fund was created last year and they intend to use the money from the new rebate under the pharmaceutical price regulation scheme on new drugs and medicines. The Welsh Government, I expect, will receive £28 million from this rebate this year. Why haven’t you allocated the maximum of this rebate—that £28 million—to be used for new drugs and medicines in Wales, as in Scotland? 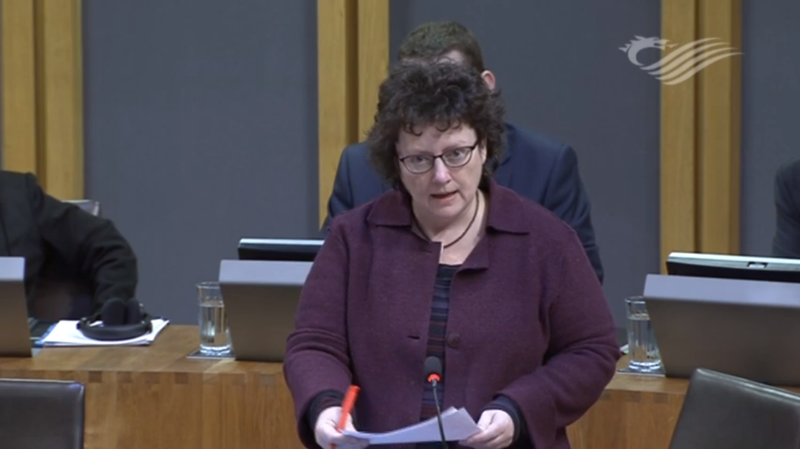 The Member is right to say that we will have £28 million as a result of the rebate and we will apply it in the Welsh NHS in a way that best meets the priorities that we face here in Wales. I have already made an announcement here on the floor of the Assembly that we will be using some of that money, for example, to strengthen the way in which the individual patient funding requests process will run in future and the way in which we will assess orphan and ultra-orphan drugs. But, we will make our own decisions about how we use the money and we will make it in a way that is right for Wales, rather than thinking that we always have to look to copy how someone else has decided to make their decisions. But it is a small percentage of the funding that you’re allocating to improve access to new medicines. Time and again in Wales we hear of people who are refused new drugs because they don’t also meet the exceptionality criteria. The case of Irfon Williams and the Fighting Chance campaign has reminded us once again of the deficiency of the regime we have in place at the moment in Wales. Now, Scotland has abolished the exceptionality criteria, and a fortnight ago Northern Ireland announced that they too intended to change these criteria significantly. However, in Wales, we continue to use these unfair and ineffective criteria for decisions that are so important. Well, I don’t accept the basic proposition in the question, Llywydd. The best evidence is that patients in Wales get faster access to drugs that are approved by the National Institute for Health and Care Excellence as being both clinically and financially effective. That’s the evidence and that’s what we use the resources we have here in Wales to support. As Elin Jones knows, we had a full review of our IPFR process here in Wales from an independent and expert group. We’re reforming it as a result to make it more effective, particularly in order to make sure that consistency of decision making across Wales is improved. I think that a system that approves more than half of the applications that are made to it cannot fairly be described—I don’t think that she did describe it in this way, but it is sometimes thought of—as a process designed to deny people the drugs for which they have made an application. Minister, despite your efforts to defend what you describe as changes to the process, we still see patients, as well as clinicians, telling us that the process is unfair and inconsistent. Just last week, we heard one Assembly Member telling of a constituent who had been refused a drug by one health board—Aneurin Bevan—had moved to Cardiff and had been given access to that drug under a different health board. As a minimum, Minister, in looking at changes, we need to create a regime in Wales that is consistent within Wales at least, rather than having seven different systems under the individual health boards. Will you now look at that, as a starting point to changing the system that we currently have? Well, on that narrow point, Llywydd, I am very happy to agree with some of the things that Elin Jones has said. It is not acceptable to me that we have decisions being made in identical circumstances but made differently between one health board and another. That isn’t an acceptable position. But changes that are already announced as part of the review will drive better consistency in decision making. But on Monday of this week, I met with the director-general of the NHS in Wales and I have asked him to look again at the recommendations made by the expert group about the number of panels we should have in Wales, and explicitly to give me further advice on whether there are additional ways in which we can try and secure consistency of decision making in this area.